IF SOMETHING DOESN'T FEEL "RIGHT"...TRUST YOUR INSTINCTS. NO, I never met Mao Tse Tung or Mao Zedong-- as his name is spelled in Pinyin. Chairman Mao died on September 9, 1976, more than ten years before I traveled to China. I’ll always wonder if the many letters I wrote to him---requesting official permission to travel China’s Great Wall--- were filed-away or if Mao’s assistant simply tossed them in the wastebasket. After meeting Steven Zhao, whose father had been in charge of Chairman Mao’s security detail, I learned some interesting facts about the founding father of the Peoples Republic of China. I learned that, at one time, Mao and Russia’s Joseph Stalin joined forces to become fast friends. Together, as communist leaders, they intended to combine their countries and control the world. Russia soon established a very-strong presence in Beijing while China did the same in Moscow. Chinese students were required to speak Russian just as Russian Schools required that students learn the Chinese Language. For a period of years, there was a serious exchange of businesses, medical personnel, and educational expertise between the two countries. Somewhere along the way of this seemingly “happy” venture, Mao began to suspect China was being used; something convinced Mao that the strong bond between Russia and China was one-sided…in favor of Russia. So…Mao set a trap. Stalin had been pushing for Mao to fly to Moscow and sign a formal agreement, cementing the two countries together as one….but with both leaders holding equal control over their soon-to-be “newly-formed” country. 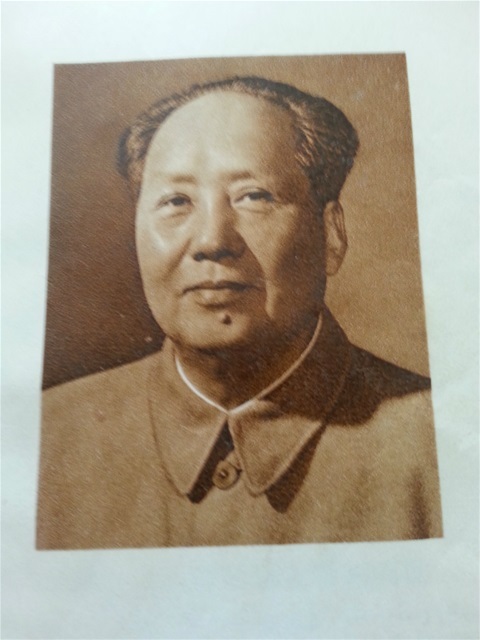 Mao sent word that he would fly in his personal plane to Moscow and arrive on a particular day. Stalin acknowledged Mao’s arrival date, saying he would have all the papers ready and just waiting for Mao’s signature. On the day Mao was expected to fly to Moscow, all was ready. Stalin called Mao several hours earlier to confirm that Mao would arrive in Moscow that day to “seal their deal”. But…just minutes after leaving Beijing’s airport…Mao’s plane exploded in mid-air. Everyone in Mao’s large circle was shocked, horrified, believing Chairman Mao had died but…those closest to the Communist Leader knew the truth. In fact, they were relieved that the Chairman’s premonitions had come true. At the last minute, Chairman Mao had selected one of his staff members to fly to Russia in his place—without alerting Stalin. Mao believed that Stalin planned to falsify his name on their “joint venture” and--after Mao’s plane crashed--Stalin could then claim both countries belonged to him..by simply producing the paperwork. Stalin would immediately declare himself-- China's new Dictator. Clearly, Mao was no dummy. He ended all communications with Joseph Stalin without another word. He withdrew the many Chinese Educators, Chinese Businessmen, and other Chinese Professionals from Russia and…ordered all Russians to return to their homeland…immediately. Today, there are many elegant and expensive buildings-- once owned and occupied by the Russian Government—now empty and abandoned-- in Beijing. The Russians won’t be allowed to occupy any part of China…ever again. After that very-close-call, Chairman Mao never flew anywhere. Instead, he ordered new train locomotives and had each one mounted with his official photo. His new and faster trains took him across China and to neighboring countries…in luxury and style. While traveling The Great Wall, I was fortunate to stop in an old town named Datong where I viewed miles and miles of abandoned trains and railroad cars. Using my binoculars, I spotted several locomotives bearing Chairman Mao's official photo. What a rare opportunity to see what I’d heard so much about. The moral of this story: Never under-estimate the Chinese when it comes to business. Chinese People are brilliant. Tomorrow, I'll share what I learned about Mao's body...after he died.